The Uttarakhand Himalaya is an integral part of the Himalaya, located almost in the centre of the Indian Himalayan Region. It has diverse topography, ranging from the river valleys terraces to the Middle Himalaya, the highlands, the alpine meadows and the Greater Himalaya. Altitudes vary from less than 300 m to above 8,000 m. Its geology is varied, characterised by its orogeny. Because, the Himalaya is the youngest mountain system in the world therefore, it is ecologically fragile and highly vulnerable to the geo-hydrological disasters. 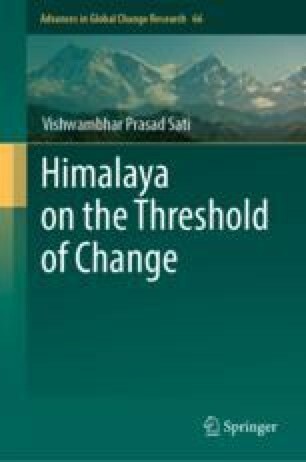 This chapter deals with geography and geology of the Uttarakhand Himalaya. The physical divisions, river systems and water bodies including the glaciers are elaborated widely.